This handcrafted pen was made from the Boston Garden "Parquet Floor." On December 22, 1999, the Boston Celtics retired its treasured "Parquet Floor." This unique floor had served as the home court for the Celtics since the franchise's 1964 inaugural season. The Parquet was first used in Boston Arena (now known as Matthews Arena) and was moved into the Boston Garden in 1952. 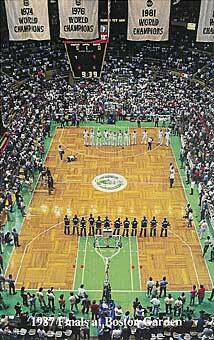 The renowned floor even outlived the Garden and was moved to the Celtics' new home, the Fleet Center, in 1995. The Parquet Floor was home to all 16 Celtics' NBA Championships and the countless moments that will live on forever in our memories. Every NBA player who is enshrined in the Basketball Hall of Fame played on this floor, including 26 members with ties to the Celtics. Twenty-two members of the Celtics organization saw their numbers retired and raised to the rafters above this unique basketball court. This certifies that this pen was made from the "Historic Boston Garden Parquet Floor."